Welcome to 2014! May it be filled with birdy blessings and love! 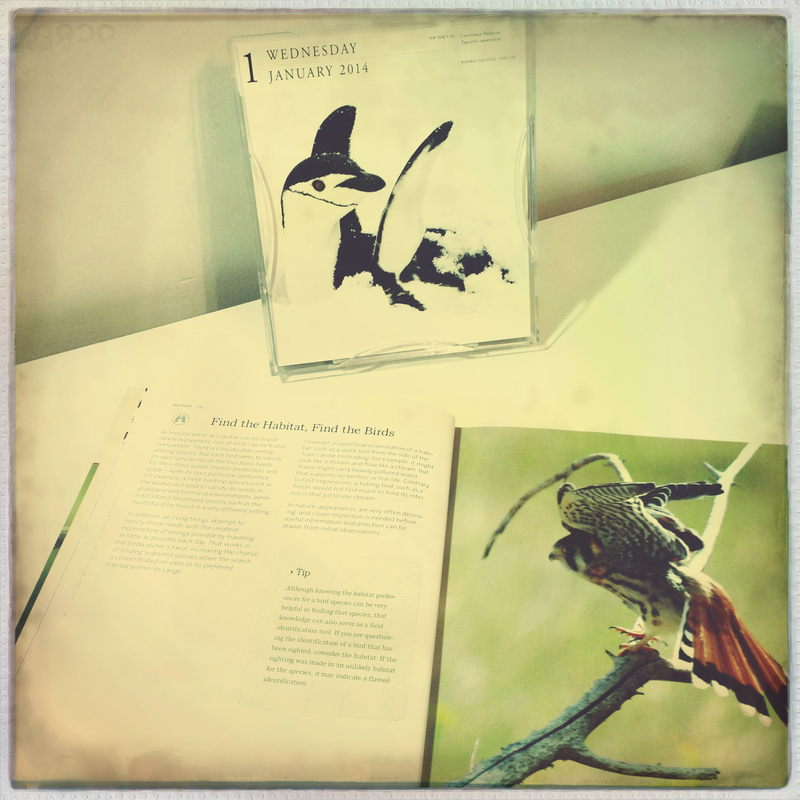 I got three calendars: The National Audubon Society BIRDS calendar. This is a daily calendar and I had it for the first time this past year. I like to slowly lift the page each day and try to guess the bird before revealing the species title. I’m pretty good until I get to birds in Africa. 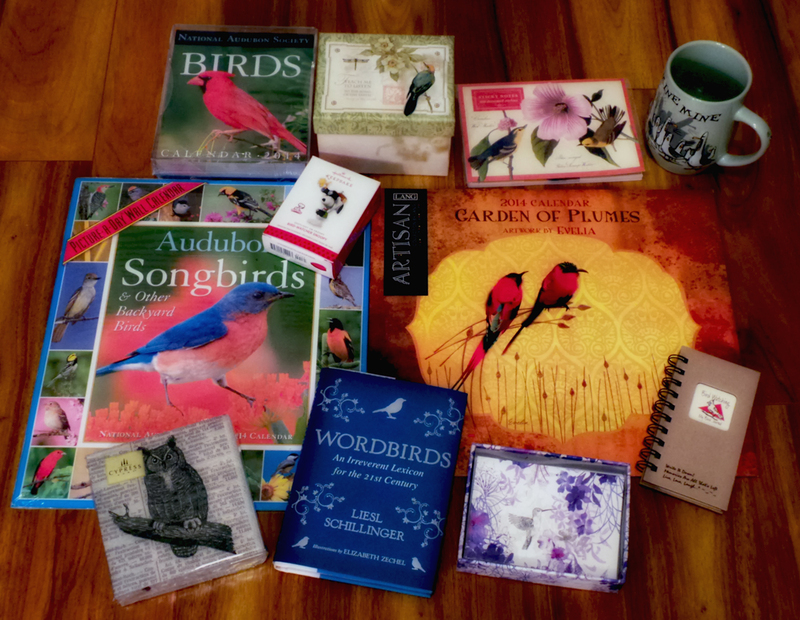 Also for the second year in a row, I received the Audubon Songbirds calendar. This is a great calendar with a different bird shown for each day and all the pictures are gorgeous. The last calendar, which I purchased is called Garden of Plumes. I thought it was beautiful and it will hang in the art room to inspire my bird-themed digital art. I stumbled upon this unique book in Barnes & Noble on New Years Eve: WORDBIRDS: An Irreverent Lexicon for the 21st Century. It’s quite creative, humorous AND there are awesome birdy illustrations inside! While at DisneyWorld earlier in December, I just had to have the MINE! MINE! coffee mug from Finding Nemo. It’s so cute and it reminds me not to share my stuff! haha! Just kidding! Maybe. No really, I’m a very good sharer! 😉 I got a tee-shirt to match which I will wear on my upcoming birding trip to Merritt Island. I have to thank my friend Nichole for the perfectly pocket-sized birdy checklist notebook! She also gave me a coffee mug with a beautiful bird illustrated on it. Thanks Nichole! Rounding out the haul were hummingbird notecards, owl napkins, birdy sticky notes and the cutest Snoopy birdwatching ornament from my dad. Now that was a fun December! But now, it’s onto more important stuff like actual birding! Holidays are done, winter is here and it’s time to go bird! See you soon with images!